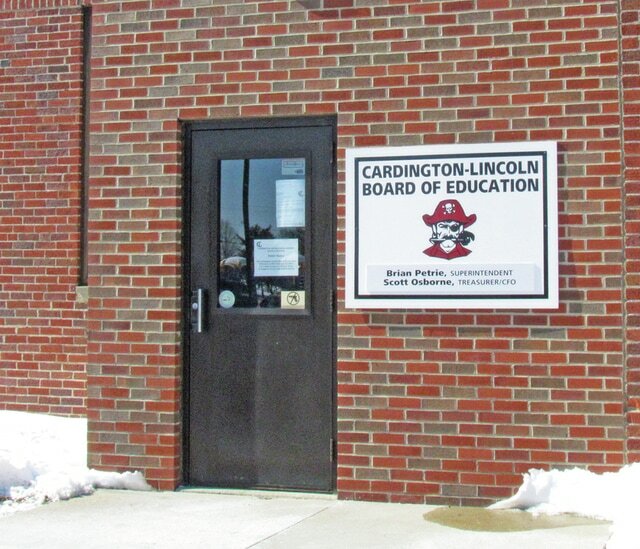 When the Cardington-Lincoln Board of Education met in a special session on July 2, they approved a shared services contract agreement for treasurer with Highland Local Schools (Morrow County) for a two year period from August 1, 2015 to July 31, 2017. Appointed was Jon Mason, who was present and welcomed by the board. The Lease agreement for the Tomorrow Center was approved by the Board and the former Intermediate building will be leased by the Tomorrow Center from July 3, 2015 to June 30, 2020. The board accepted the resignation of Jodi Brown, junior high/high school English and Intervention teacher, effective June 30, 2015. The following exempt non-teaching salary schedules were approved for FY 16: facilities and operations; assistant treasurer and administrative assistant to the superintendent. Under communications, Supt Brian Petrie said the medical Insurance renewal will have a ten per cent raise. He also noted the projections from the state budget in FY 16. “We anticipate about $440,000 and for FY 17, $300,000,” said Petrie. “This gives us the kind of cushion we need, the carryover we approved.” But he cautioned about the need for keeping costs reined in. Absent from this meeting was board member Vicki Kerman. Board member Marilyn Davis was appointed as record keeper/treasurer pro tem for this meeting which was 22 minutes long. The board will meet next on August 10, 2015.